Making a party this week-end? 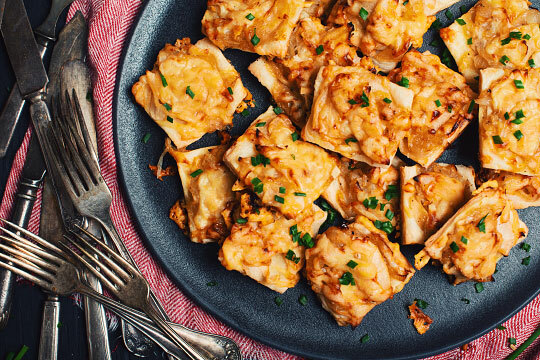 These flaky bites with apples, beer caramelized onions and Gruyere cheese will make everyone happy! Don’t feel like making bites? Prepare this dish as a tart and cut it the size you want! Preheat the oven at 400°F. Line a baking tray with parchment paper. In a big skillet at medium-low heat, add 3 tablespoons olive oil and the onions. Season with salt and pepper then stir well. Cook slowly to caramelize for about 10-12 minutes. Add oil if necessary. Onions must not sear, lower heat if that is the case. Crank to medium-high heat then add the apples, beer, maple syrup and fennel seeds. Season with salt and pepper, stir well and continue cooking for 5-6 minutes, until liquid has evaporated. Remove from heat and let cool down 5 minutes. On a floured working surface, roll down the dough to form a 42 cm x 30 cm rectangle, then cut in 6 cm X 6 cm squares. Place the squares on the parchment paper then add about 1 teaspoon of the mix on each of them. Make sure they all have onions and apples! Add the cheese on top then place in the oven. Cook for 20-25 minutes, or until dough and cheese is golden. Let cool down 2 minutes before eating. A classic but expressive Chilian wine with warm pear, vanilla and corn cream notes. In a fresher style but still classic, this chardonnay brings notes that we know and love from the Burgundy region. 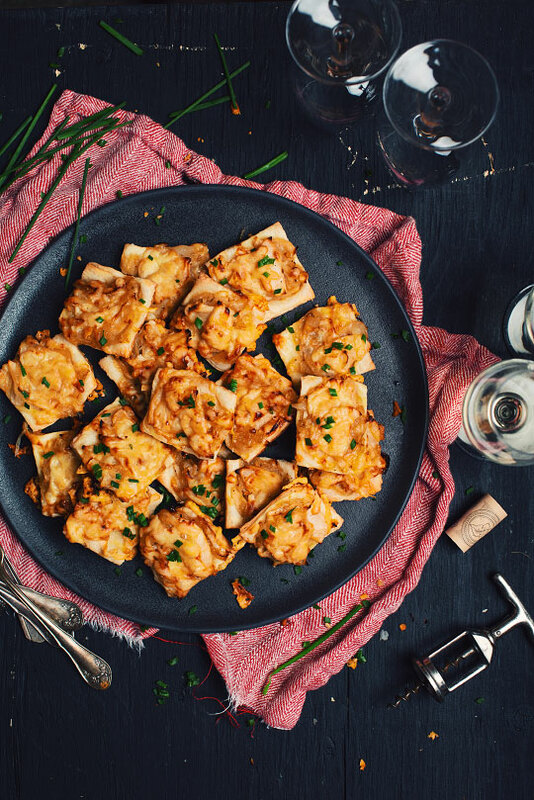 Apple, caramelized onions, maple syrup and gruyere cheese only want to be eaten with a beer with aromas of butterscotch and slightly grilled cereals. That’s exactly what this bitter beer offers! You will also taste notes of grilled hazelnuts that will emphasize grilled gruyere cheese aromas of this dish.